Aaron Hernandez has been found guilty of first-degree murder by jurors after a lengthy trial in Fall River, Mass., CNN reports. The conviction means that the former New England Patriots tight end faces life in prison without the possibility of parole for the shooting death of Odin Lloyd, whose body was found in June 2013, the news site notes. Hernandez was also found guilty of unlawful possession of a firearm and unlawful possession of ammunition. Jurors reached a verdict early Wednesday morning. As CNN notes, prosecutors took months building their case, presenting more than 130 witnesses, whereas the defense took less than a day to finish up with its witnesses. Prosecutors argued that Lloyd, a semipro football player, was seen on June 17, 2013, with Hernandez and two of Hernandez’s friends at around 2:30 a.m. Later in the day a jogger found Lloyd’s body, which had gunshot wounds. Hernandez’s friends Carlos Ortiz and Ernest Wallace have also been charged with murder, to which they have both pleaded not guilty. CNN notes that they will be tried separately. Hernandez’s lawyer declared that his client had “witnessed” Lloyd’s murder, which was “committed by somebody he knew.” The lawyer added that he “really didn’t know what to do, so he put one foot in front of another” and continued on with his life, the news site reports. Evidence in Lloyd’s death has also connected Hernandez to a separate murder case in Boston, which has him facing two other murder charges. He has pleaded not guilty to those charges. 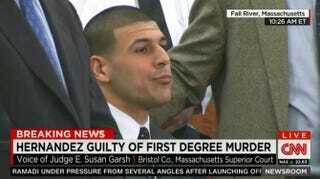 The trial for the Boston case is scheduled for May, but officials say that it will be moved back, according to CNN.